While we welcome the publication of the Chilcot Inquiry's report, there was never any question that Tony Blair was a key accomplice in the launching of the 2003 invasion of Iraq. Holding Blair accountable will advance the principle of accountability as well for the U.S. architects of the Iraq War. 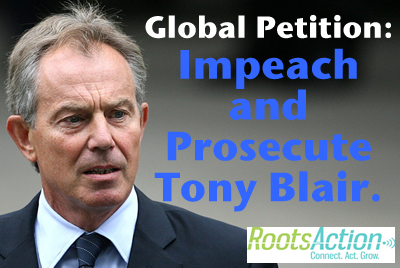 Tony Blair should be impeached and prosecuted right now for his role in launching war on Iraq. 17853 2 years ago Karen Neubauer Huntsville, AL , AU War Crimes!! 17850 2.1 years ago Catherine Smith Everett, WA , US Justice now! 17848 2.1 years ago John Nerding Banbury, GB Let him face justice. 17838 2.5 years ago Janet McLaughlin Edinburgh , GB Blair has milked the system and gathered millions of pounds profiting from his past decisions. He should. Be impeached . 17836 2.5 years ago R Begum California, CA , GB He needs to take responsibility for what he has done. He does not even regret it! 17833 2.5 years ago Michael Plowman WAHIAWA, HI , US The motion to hold Blair to account for misleading parliament was supposed to be debate in September in the HOC. Did this happen? 17831 2.5 years ago Heather Soper London, GB He should be prosecuted for crimes against humanity. His ''New Labour'' had people fooled, including me. PDF of first 17,000 signers.